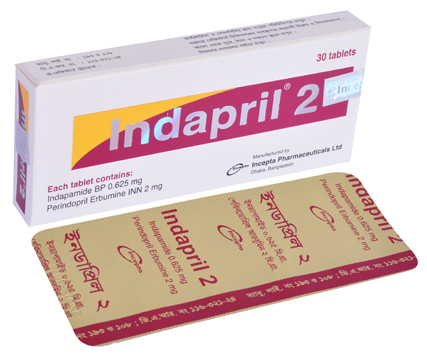 Indapril 2: Each tablet contains 0.625 mg of Indapamide and 2 mg of Perindopril Erbumine. 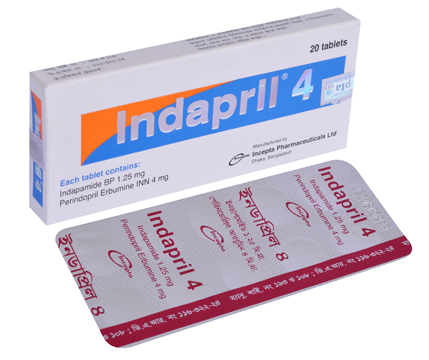 Indapril 4: Each tablet contains 1.25 mg of Indapamide and 4 mg of Perindopril Erbumine. Indapril, a fixed combination of an ACE inhibitor and a thiazide-like diuretic, leads to additive synergy of the antihypertensive effects of the two constituents. Its pharmacological properties are derived from those of each of the components taken separately. In addition to those due to the additive synergistic action of the two constituents, when combined, it shows beneficial effects on vascular endothelium, arteriolocapillary microcirculation, and the target organs of hypertension. One tablet daily, preferably to be taken in the morning and before a meal. Renal failure: Creatinine clearance (CrCl) >30 ml/min: no dosage modification. CrCl <30 ml/min: treatment contraindicated. Asthenia, dizziness, headache, mood swings and/or sleep disturbances, cramps, hypotension, allergic reactions, skin rashes, gastrointestinal disorders, dry cough, dry mouth, risk of dehydration in the elderly and in patients suffering from heart failure; changes in blood test results may occur. Disorders of electrolyte balance, diabetes, gout, hypotension, or strict sodium-free diets, heart or renal failure, atherosclerosis, renal artery stenosis, elderly.